The Battle of Saratoga was one of the important American victories in the American Revolution. The victory not only prevent the British from cutting off the four New England Colonies from the remaining nine colonies , it also brought French into the war on the side of the Americans. Today at the battle sites, there is Saratoga National Historical Park with its Boot Monument (see store of Breymann Redoubt). Ten miles away at Victory Mill, the site of British Surrender is marked by the Saratoga Monument, with its famous "missing statue" (see store on Saratoga Monument). On October 17, 1777, after being totally surrounded by the men from New England States. 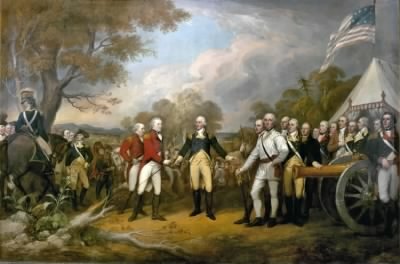 General Burgoyne surrenders to General Gate along with 6000 British soldier and huge quality of guns and ammunitions. The victory at Saratoga couldn't have came at better time, as General Washington's Army was defeated on September 11 at Brandywine, near Philadelphia. The British then proceeded to capture Philadelphia on October 1. The victory at Saratoga was the victory that American needed to convince the French to join the American.